I love the shape of this skirt… totally ready to par-tay! Who says girls can't rock tuxedos too? What will you be wearing to ring in 2014? Wow that is a killer skirt! Totally NYE awesomeness. This is so cute! Love the metallic pieces and that leather jacket! I love that you are starting to thrift!! Love this look. Its flirty, girly and cool all at the same time! Get it girl! HELLO LEGS FOR DAYS! Girl you are looking SMOKIN' in that skirt! The outfit is already cute, but with the jacket it's PERFECT! Oh girl. This is so so so fab! Love the skirt with the shoes. Perf. You are working this look. I love it! Great styling. Happy New Year to you...XO! OMG i loveeee this look. you look amazing. need that skirt! That skirt is super cute, I love the pattern! 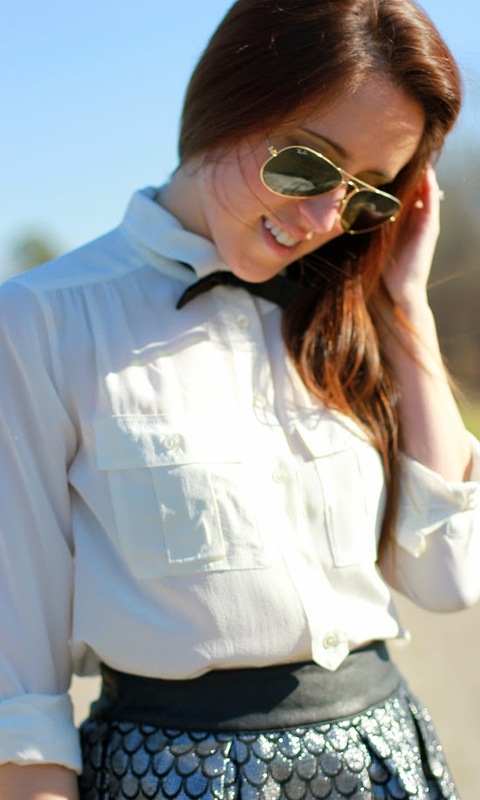 Love that skirt and the bow tie is darling! You're adorable! This tux inspired look is just so good! Absolutely adore this skirt! So fun! woo hot momma!! Love that little short skirt - you styled it well! THIS is how you do a girly tux! Fan-freakin-tastic!! Happy New Year! What a fun outfit! And this skirt makes you legs go on for miles! OMG love this tux-inspired look! So perfect! Thanks lady! I do enjoy overdoing it on the sparkle sometimes, but just a tiny pinch is fun too! Aw, thanks lovely! The skirt is doing all the werk! haha, it totally has a fish scale vibe, but in a cool mermaid way, right!? Yay, you won't regret it! I am constantly surprised my how many times my silver shoes have been clutch in an outfit pinch!